It is almost invariably the goalscorers who get all the attention after a football game; but even the most prolific goalscorers in world football will be the first to say that they have the easiest job of all sticking the ball into the net. Football is and will always be a team game; and goalscorers will have nothing to celebrate were it not for the silent graft of some of their teammates. So while Phil Younghusband’s man-of-the-match performance against Laos in the Suzuki Cup last night might have caught the eye, as did Patrick Reichelt’s brace, the convincing 4-1 victory could not have been achieved without the contributions of the team’s unsung heroes. For starters, this feature takes a look at three of these. When one considers that there have been Europe-based players who were quick to make themselves unavailable for selection by the national team because of personal differences with Thomas Dooley, then one can all the more appreciate what droopy-eyed Jerry Lucena continues to do for the country sans the fanfare that typically surrounds the other players. At 34, Lucena in footballing terms is no longer a spring chicken. Yet, his work rate against Laos in the Philippines’ opening AFF Suzuki Cup match was remarkable. This was all the more so because he had planed in from northern Europe. A quick check of Denmark’s average temperature shows 7º C. In Hanoi, it is 22º C.
He is too young to have heard of or to care of the 13-1 loss to Indonesia at the Bung Karno; or of the number of times Thailand treated the matches against our team as a light afternoon stroll in the park. He may be burdened by expectations but he is unburdened by history. Ask any football player and he will in most likelihood tell you that the body will be more tolerant of a change in playing conditions from hot to cold than it will be of cold to hot. Yet, you could not tell from Lucena’s hard graft in Hanoi last night that he had just flown in from somewhere close to where Santa flies around with his reindeers. In contrast, Paul Mulders when he was based in Europe used to look totally indifferent after crossing the continental divide and did not play anywhere near his true worth until at the very least the second match. I lost count last night of the number of times when Lucena made timely tackles to stop Laos dead on their tracks, including one professional foul upfield that in all honesty ought to have earned him a yellow. The droopy eyelids notwithstanding, Lucena is a pro and knew when to nip a counterattack in the bud. Lucena used to be employed mostly in the holding midfield role and sometimes farther back in central defence; but under Dooley he has been encouraged to foray forward more. Last night, we all saw evidences of his passing range that we probably had not seen before. The left-footed cross from which Phil Younghusband scored last night was accurate to the millimetre; but it was a sumptuous through ball to Martin Steuble much earlier that really caught the imagination. It showed a vision to unlock defences that few of us had previously associated with Lucena. While Younghusband deservedly wore the captain’s armband, it was Lucena’s quiet assuredness and no-fuss approach to the game that gave the Philippines so much stability. I hope Dooley can wring a few more years from this loyal servant who, in my opinion, is a wonderful example to younger players. Just last year, Misagh Bahadoran was the sort of player whom I would place under the category ‘bad for healthy hair.’ You know, the sort that drove football fans crazy and made them want to pull their hairs from off their pates. One could never fault him for effort; and he was always the sort who gave 150% into any match he was involved in. I do not believe that there is another player on the team who has taken as much physical punishment as Bahadoran has over the years. Therein, your honour, was the problem. There is, in football, this thing called trying to do too much. When he ran with the ball rather than bounced it off his teammates to get behind defences, he invited defenders to get nasty and cynical on him. He could also be guilty of playing like a headless chicken, just running all over the place without seeming purpose and sometimes even getting in the way of teammates. Times like these, football fans like me needed massive doses of Regroe. The most common explanation that I heard from people was that he was really more a futsal player and, therefore, accustomed to the more limited futsal playing court. Not that I ever bought that line of thinking because bad decision making is bad decision making whether in futsal or in football. No, what Bahadoran needed was coaching! It remains to be seen whether Dooley will be the one to take us to the higher level that we all crave for; but under him Bahadoran is no longer a headless chicken. The latter is by no means the finished article; and indeed it was his senseless foul against Myanmar that cost us the Peace Cup. However, in recent matches, we have seen Bahadoran become more discriminate of moments when he would run with the ball. He has also learned to link up with his teammates more. Of course, there was this one moment in the second half when he shot from an impossible angle, the sort of decision-making that I used to nick my players’ ears with my fingers for. Somebody had also better teach him to crouch over the ball when shooting from distance, as indeed he sent one such effort into Row Z. And there are few players on the team I would like to see score a goal more than Bahadoran, because he so richly deserves one. 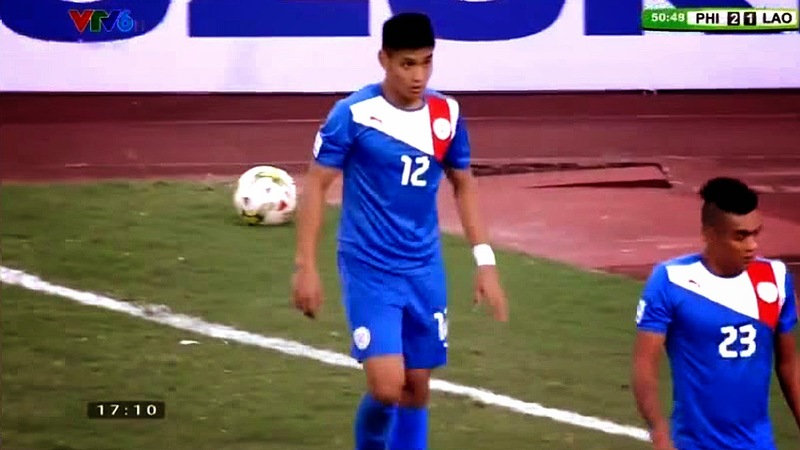 I would rate Bahadoran as one of the most – if not THE most – improved Azkals under Dooley. If he can keep improving at the same rate that he has over the last few months, then he may yet develop into one of the Azkals’ certifiable legends. Bahadoran is still only 27 and the peak of his career is still ahead of him. I have not seen the personal statistics of last night’s Suzuki Cup match against Laos, but off the top of my head, my guess is that no other Filipino defender made more timely interceptions and crucial sliding tackles than young Amani Aguinaldo. I find it almost hard to believe that he is, at 19, as young as the last group high school boys that I coached. One or two of the sliding tackles appeared to have hurt him; and there were brief shots of him moving his foot up and down as players do to shake the pain off before the camera panned away further upfield. Older and bigger players would have made a meal of the pain. Young Amani shrugged off the discomfort and just got on with it. I was mortified in the last Challenge Cup that Dooley could be so brazen as to blood the inexperienced Amani; and indeed, the anxiety on the lad’s face was evident for all to see on television. Yet, even in the final, what ultimately spelled the difference between Palestine and the Azkals was a mistake by the more experienced Jason de Jong. In the Suzuki Cup, we are all reaping the benefits of Dooley’s vision – or boldness, if you wish – because on last night’s form, captain Robert Gier may not have an easy way back in. As recently as the friendly against Cambodia, Amani was still making rash challenges where more experienced defenders would prefer to stand their ground and coax opposing attackers away from danger. Last night against Laos, his decision making was generally sound and he played with a composure that belied his years. So much so that, on the basis of performance alone, he sometimes looked as though he was senior to his center-back partner Juani Guirado. It has been a tremendous weight that has been heaped on the young man’s shoulders for indeed, on him and his teammates now depend an entire nation’s hopes and dreams. It is almost hard to conceive that he is still a college boy who probably still lives at home with his parents; yet it is probably the gift of youth that is his greatest strength. He is too young to have heard of or to care about the 13-1 loss to Indonesia at the Bung Karno; or of the number of times Thailand treated the matches against our team as light afternoon strolls in the park. He may be burdened by expectations but he is unburdened by history. Moreover, he plays for a side that stands as the equal of our erstwhile more illustrious Southeast Asian neighbours. Perhaps what I personally appreciate most about Amani other than his youth and his obvious future in the game is that he represents a way through for not only his contemporaries but also the countless youngsters around the country who picked the game up after Azkal-mania took off. Whilst once youngsters like him would be getting ready to hang up their boots after graduation from college, now there is good reason to keep on playing. In fact, Amani represents the future in football that many of my own as well as succeeding generations would have opted for had we had the chance but just never did.